Cody shows the height of the sorghum in the planter. I feel lucky that I get to grow things as part of my job as testing coordinator. Last year, I was asked to grow a variety of plants in the Gardener’s Revolution® Classic Tomato Planter. We wanted to grow something that would get very tall, to make sure our new tie-downs would keep the planter upright. Cody, our Product Designer, suggested we try sorghum. We grew it from seed, right in the planter. 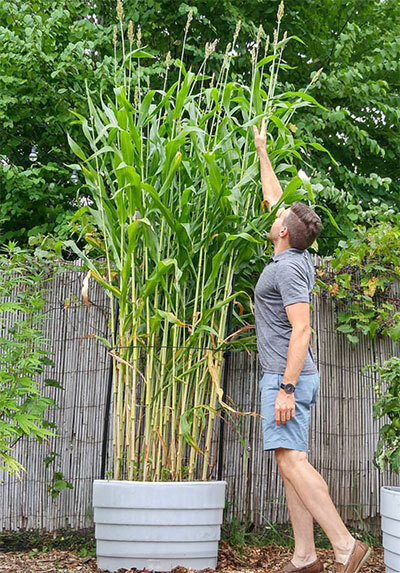 In less than three months it shot up to about 8′ tall and, yes, the new tie-downs successfully prevented the planter from tipping over. In fall, it was beautiful to see the color of the canes become mottled with reds and oranges. We harvested them in the hopes of extracting the syrup to make molasses, as we heard they do down south, but we never figured out how to do that. As Vermonters, we know how to make maple syrup, but sorghum syrup is an unknown to us! Because of their beauty, I didn’t have the heart to compost the canes, and kept them all winter. Come spring, we brought them back out to the test garden and made a trellis out of them for peas, not knowing if they would be strong enough. The harvested canes in fall — loves those colors! 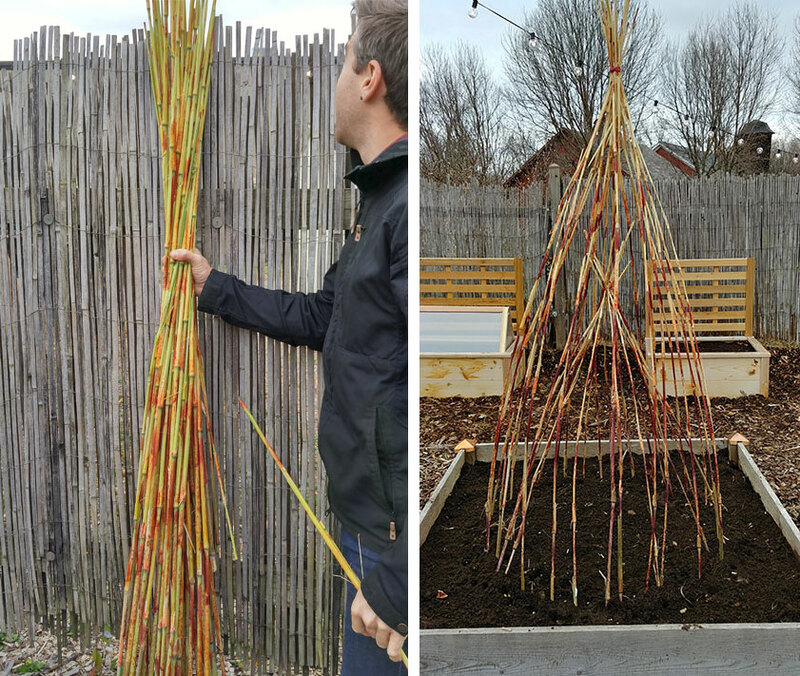 — and the teepee trellis we made in early spring. As you can see in the photo, the sorghum teepee trellis worked and the peas are growing up the canes beautifully! Peas have grown mid-way up the trellis. Will it work? Yes! 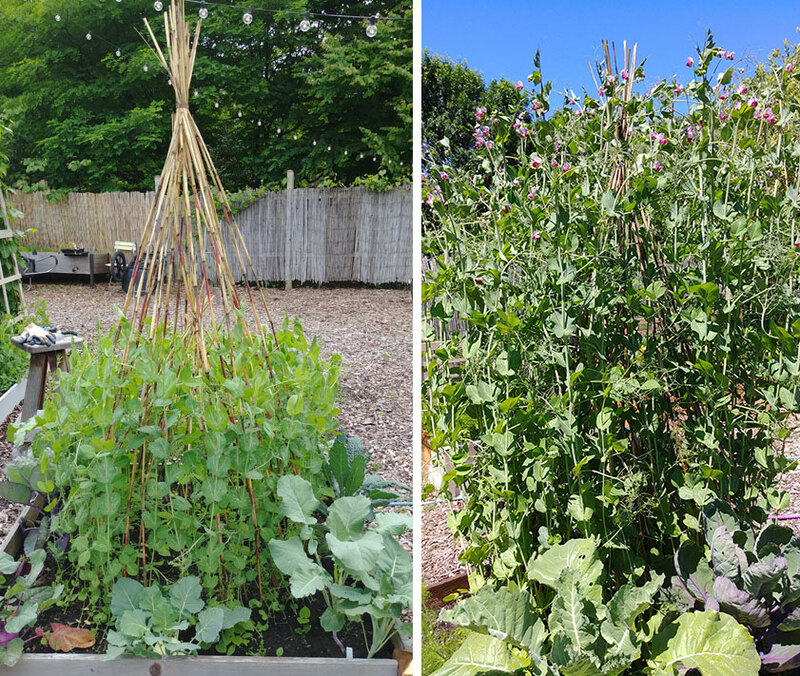 Fully grown peas reaching the top — the perfect height! It’s always fun to try new crops, isn’t it? Deborah Miuccio is our Product Testing and Research Coordinator. I found your web site very interesting!! Where would I find.the wooden planter? if you figure out how to harvest the syrup, please let us know – I am intrihued!